Process (Programs, Tools, Skills): I started with a printed photo and scanned it with an office printer. I chose a resolution of 300ppi, not knowing for certain how large I would end up using it in the final design. Then I uploaded the image into Microsoft Word several times and enlarged and cropped portions to 3 rounded rectangular shapes to go near each other. I then decided on a color scheme and type that would work well with the message and arranged everything on the page. Working with Word, in the publishing mode, was surprising reminiscent of the Adobe suite and had more features than I expected. I used Microsoft Word, a Ricoh Scanner, and PDF2JPG.net (PDF converter). Message: The local garden club is hosting a plant sale in order to fundraise for the club and to engage with the community. 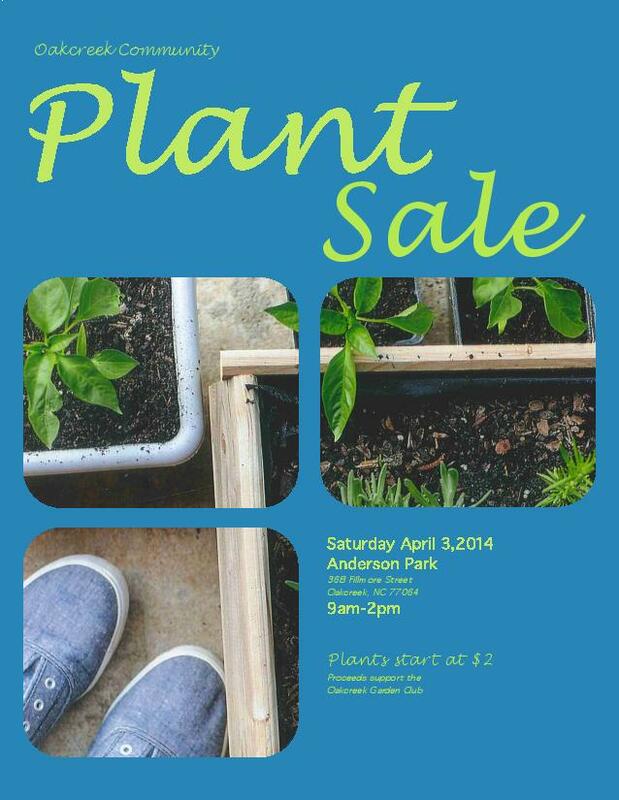 Audience: Any community members who may be interested in buying plants at an affordable price. I want people of all ages and skill levels with gardening to feel welcome and interested. Color scheme and color names: Green, with adjacent colors. Top Thing Learned: I learned that what you see on the screen and what prints can be very different variations. I had the printer make 7 copies until I was happy with the result. Scanned images used, sources, original sizes, location of scanner used: I used my own original 4×6 glossy photo print, and scanned with an office printer with a resolution of 300ppi. I really like how you laid out your images. Though the images are separate, there is an implied connection between them. I also like how you aligned your elements. Everything works together to create a great visual hierarchy.